See some of the reviews our awesome customers have left us! Fire Pro showed up right on time to inspect and clean my fireplace chimney. The work was clean and efficient. The price was very reasonable. The owner, Scott, has many years of experience in the industry answering my questions about safety with knowledge. I appreciated the time he spent explaining safety issues with me. Now I feel that my family is safe when enjoying a fire in our fireplace. Scott even donated the invoice to my program to feed the homeless. 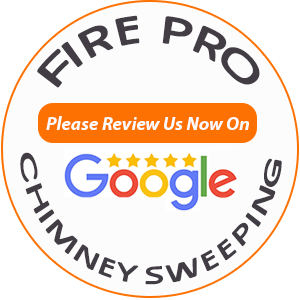 You cannot ask for a better home town chimney sweeping business than Fire Pro. I hadn't had my chimney done over 4 years. Scott came and handled it quickly and professionally. Now that he educated me on the importance of keeping it clean, I'll have him coming back every year. Price was very fair. Highly recommend. I called Fire Pro for a chimney cleaning price, the guy on the phone was very nice, and a pleasure to talk to. They had a great price, and said they could be here sooner than I thought they would. Scott was the tech that showed up, he was very clean, he used blankets, and when he was done everything looked very nice. We were afraid to use our fireplace as we recently bought the house and the chimney looked bad and didn’t want a house fire. After his complete reassurance that we were good to go, we haven’t had a second thought about enjoying a fire. I called in dire need of a chimney sweep the gentlemen was very polite and the prices were great he was able to come out in almost no time flat and made short work of my chimney in a clean and fast manner i was a very pleased customer.